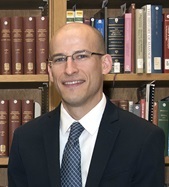 A wealth of medical history awaits your exploration in the National Library of Medicine’s (NLM) free and full-text digital archive of journals PubMed Central (PMC)! Known to most of its users as a free, full-text archive of recent biomedical journals, PMC also reaches back in time over two centuries. An account of centralized health and relief agencies in Massachusetts during the 1918 influenza pandemic; an article by Florence Nightingale on nursing reform; a paper by W. H. R. Rivers on his treatment of “war neuroses” during World War I; a medical case report on America’s 20th president James A. Garfield, following his assassination in 1881; post-World War II thoughts about the future of the Army Medical Library by its director Frank Rogers; and seminal historical research articles aplenty: by Sir Alexander Fleming, on the use of penicillin to fight bacterial infections; by Walter Reed, on the transmission of yellow fever by mosquitoes; and by the bacteriologist Ida A. Bengtson, the first woman to work in the Hygienic Laboratory of the U.S. Public Health Service, the forerunner of the National Institutes of Health. These articles represent just a fraction of the more than one million articles comprising PMC’s historical holdings, scanned from 160 journal titles beginning in 1809 and spanning 200 years. These holdings are the outcome of the Medical Journal Backfiles Digitization Project (2004-2010), a partnership between the Wellcome Trust, the Joint Information Systems Committee (JISC), NLM, and a number of medical journal publishers interested in publishing backfiles online. Building on this previous effort, the NLM and the Wellcome Trust are now working together to expand PMC’s historical holdings in the area of mental health and general medicine, a collaboration that will add substantially to the current total PMC archive of over 3.8 million articles. PMC is full of amazing individual items, but what follows is a wider view of what its one million historical articles look like. The word clouds below reveal the depth and diversity of this historical collection by journal title, its major subject areas by NLM Medical Subject Headings, and its chronological scope by publication year, stretching from the early nineteenth century to the late-twentieth century. PubMed Central includes complete historical backfiles of over 160 journals. The top 50 titles are represented here in approximate proportion to their volume in the collection. 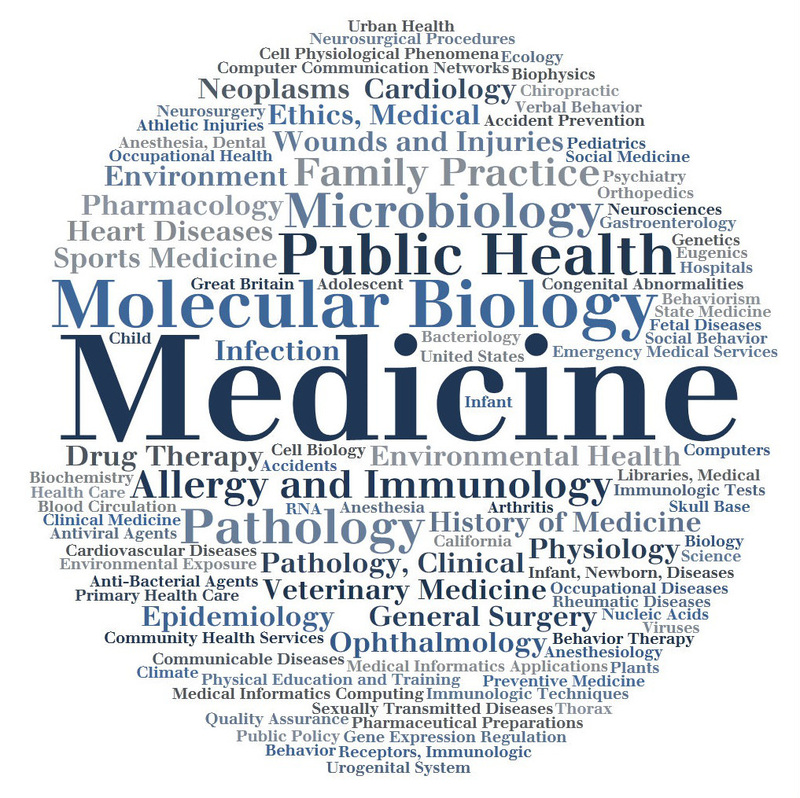 PubMed Central historical titles cover a range of medical topics from general medicine, to specialized fields like neurosciences, occupational health, and gene expression regulation. 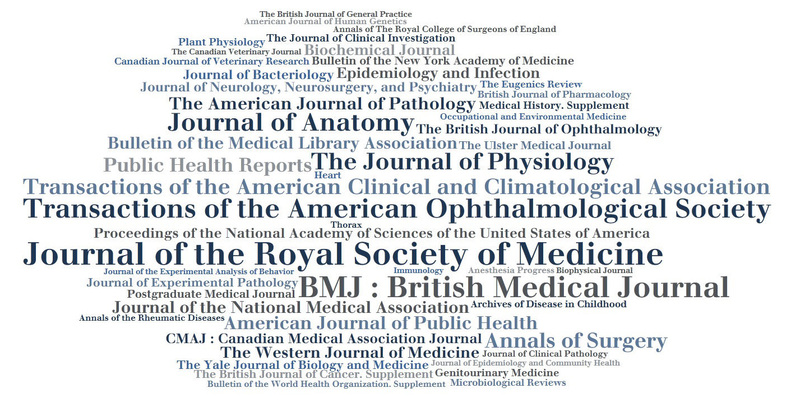 Journal topics are represented here by each journal’s Medical Subject Heading (MeSH) descriptor, displayed in approximate proportion to its frequency in the collection. 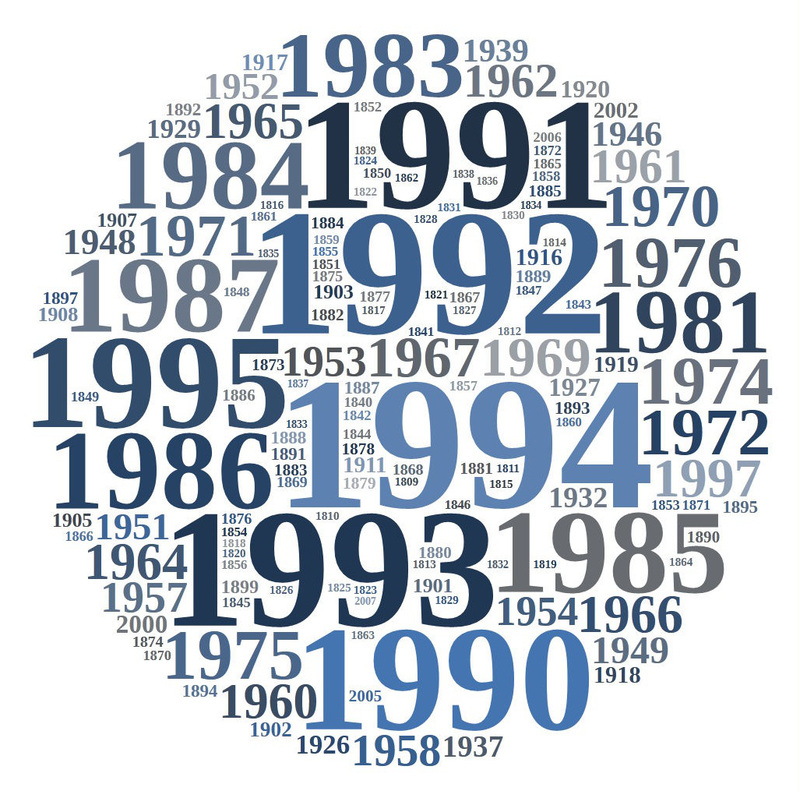 PubMed Central hosts 200 years of historical journals, from 1809 through the early 2000’s. The collection starts with a small handful of journals and peaks at over 80 titles in the 1990s. This image reflects the number of journal titles in a given year, where larger years indicate more titles. As rich as PMC is in pre-20th century journals, its more recent, post-World War II content is especially vast. This fact helps to explain why, of all the medical subjects represented in the collection, “molecular biology” appears to be the second most frequently occurring subject. Still, an overall review of subjects in PMC points to research in the specialty fields of ophthalmology beginning in 1865, public health starting in 1879, and climate and medicine emerging as early as 1884. What could these early studies tell us about the formative years of these fields of inquiry, and what other articles, or historical trends, might they help to reveal in PMC, and elsewhere? If we haven’t already enticed you to explore PMC, here are a few more items that we hope will lure your interest: an appeal for justice by Arthur Conan Doyle, related to the infamous case of the Parsi English solicitor George Edalji, which reflected contemporary racial prejudice; early research of NIH scientist Marshall Nirenberg, then a future Nobel Laureate; an overview of medical libraries in World War II-era U.S. Army general hospitals, and an obituary of Elizabeth Blackwell, the first woman to receive an MD degree from an American medical school. So, what are you waiting for? Dive into PMC! Encourage your friends and colleagues to explore it. Use the comment feature below to let us know what you discover. 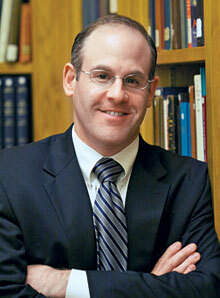 Tyler Nix, MSLS, is an Associate Fellow at the National Library of Medicine. 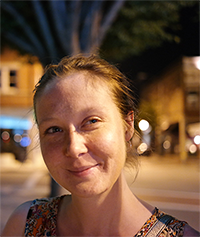 Kathryn Funk, MLIS, is Program Specialist for PubMed Central in the National Center for Biotechnology Information at the National Library of Medicine. 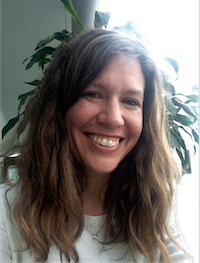 Erin Zellers, MLS, is Publication Specialist for PubMed Central in the National Center for Biotechnology and Information at the National Library of Medicine. It was an honor to share this with the faculty, students and staff at NYU Langone Medical Center/NYU School of Medicine! Thank you for your feedback, and for sharing this post and the rich information it offers! And thank for following our blog!